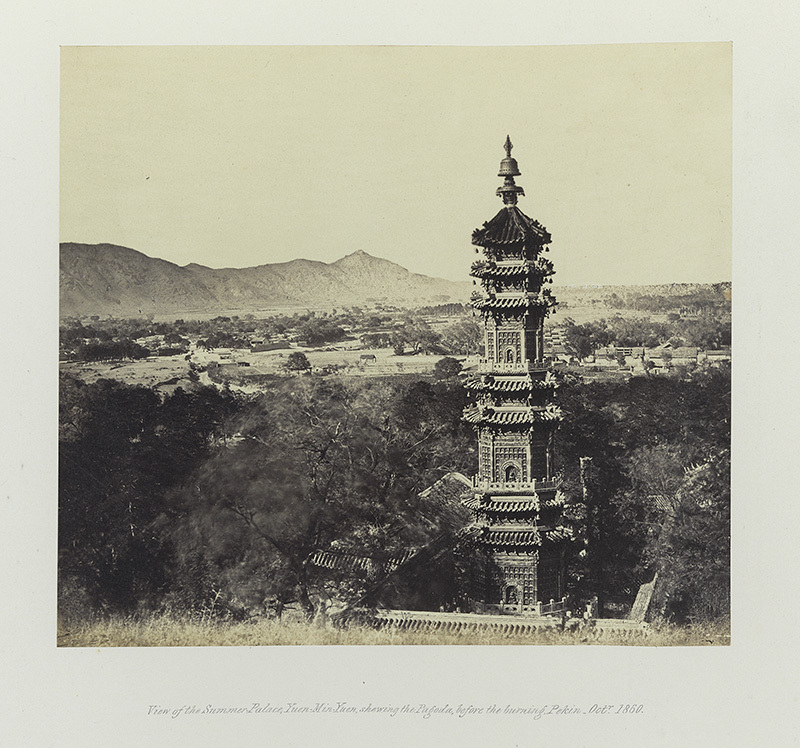 One of the works in the ECA Rare Book Collection that places us firmly in a place and time in history is a book of photographs taken around the time of the notable expedition of Lord Elgin, James Bruce, to China on a diplomatic mission and military campaign. If one does not know much about Chinese history, which I must admit I know little of, you might view this image at first glance as simply another beautiful view of Chinese landscape and architecture. Upon further reading into the life of the 8th Earl of Elgin and the Old Summer Palace, as well as the photographers whose works are featured in the album, it becomes a much different story. One of these photographers was the talented Felice Beato who was known for photography that created images of war as a continuous process. He documented each stage of his subjects, including gruesome scenes of the aftermath of battles and seizes. This method provides great insight into the progression of Lord Elgin’s presence in China as many images fit into his timeline. Although the above photograph taken in 1860 seems to show a sturdy structure overlooking a stunning mountain range, it does depict a cultural landscape that was near the end of its time and one that was extremely vulnerable at the time. The caption for the image tells a snapshot of the gruesome story. The caption reads “View of the Summer Palace, Yuen-Min-Yuen, showing the Pagoda before the burning, Pekin. Octr 1860.” This could easily be one of the last photographs of the site before its infamous looting and burning on October 18, 1860. Many of the items taken from this event are still held today in the UK and other prestigious museums in Europe, although there is an ongoing conversation of where these works of great art and cultural importance belong.